This week I’ve re-released a story that was originally published by Amber Quill Press. 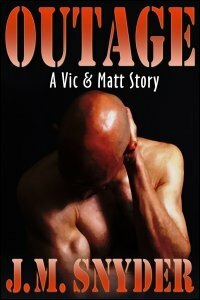 Outage is the story where Matt outs himself to coworker Roxie when she drags him to a boring, day-long workshop on office administration. Of course, the winter storm the weatherman’s been predicting for the past few weeks decides to hit the same day. Matt’s only consolation? The workshop is held in one of the high-rises downtown, and whenever his lover Vic Braunson’s bus route brings him near the building, they can communicate telepathically for a few moments. The wintry storm hits harder than anyone anticipates, downing power lines and taking out electricity to most of the surrounding localities. When Roxie learns that the gym where they work has closed due to inclement weather, she convinces Matt to ditch the workshop. They duck into the elevator moments before the building’s power goes out, trapping them inside. The next time Vic’s bus brings him near the building, Matt calls out to his lover for help. Vic’s current superhuman ability is an electromagnetic power that should allow him to recall the elevator to the lobby. But the street is blocked off by fallen power lines and the building’s concierge won’t let Vic near the mechanical room to work his magic.